I finished another ‘roman dur’ by Simenon, L’Enterrement de Monsieur Bouvet, one might say a rather unremarkable novel were it not for the fact that it makes one realize that it used to be possible to lead a double life, to disappear many times in one’s life and start all over again elsewhere without leaving a trace. And were it not of course that this is a Simenon ‘roman dur’ and this is the only ‘genre’ I currently enjoy, and have for a year or three. 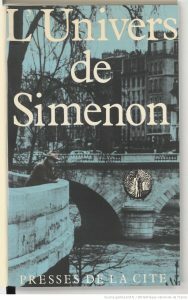 Wile researching this novel, I came across L’univers de Simenon : guide des romans et nouvelles (1931-1972) de Georges Simenon(1983) by Maurice Piron and Michel Lemoine. It’s hard to believe that Michel Lemoine is the same person as the cult actor and director of French cinema of which I will post a photo. This entry was posted in 1001 things to do before you die, European culture, film, grotesque, literature on November 11, 2018 by jahsonic.